Is it snowing in Stowe ?Thank you! 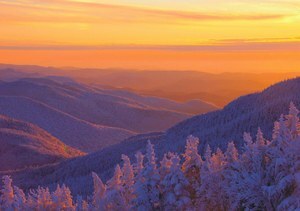 Stowe, in the United States (Vermont State), is a large resort with 12 lifts (9 chair lifts, 3 surface lifts) that offers skiers an impressive 719 metres (2360 feet) of vertical descent. 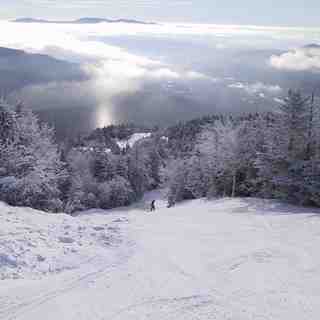 Stowe has 480 acres of terrain over 47 trails with a total length of 100 kilometers (62 miles). Stowe is best suited to intermediate skiers and snowboarders but there is some terrain for beginners and advanced skiers. 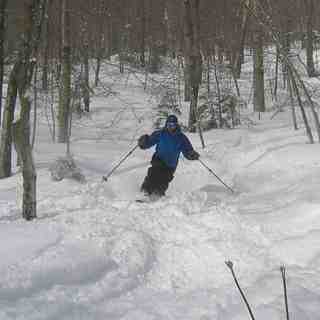 There are 150 kilometers (94 miles) of cross country ski trails at Stowe. For snowboarders, there are 2 terrain parks and a half pipe. 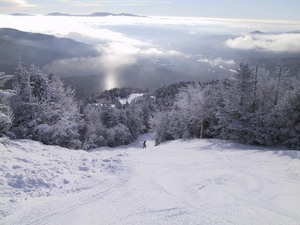 The majority of the trails at Stowe are covered by snow-making. The nearest airport is at Burlington and the nearest train station to Stowe is at Waterbury. There is accommodation located close to the pistes but we would welcome additional information about any hotels or chalets in Stowe. I've skied New England for over 30 years and Stowe is in my "Top 3" category ... and those three are pretty much tied, each having their own charms. Consistently the best conditions of any mountain in the area. They've invested heavily in their snowmaking in the past 8-10 years, and it's really paid off. They've got all state-of-the-art equipment covering 80% of their terrain. Consistent pitch ... top to bottom. There's no traversing. No ski this trail to get to that trail, yadda yadda. You ski this mountain from top to bottom with no long run-outs, etc... to get back to the lift. "Chill" ski patrol. Unlike other mountains, the ski patrol at Stowe doesn't act like a police force. If you don't get hurt or act like a jerk, you'll hardly see them all day at this mountain. That said, this is the oldest and possibly best-trained ski patrol in the US. They take great pride in their history and professionalism, and when you need them they'll be there in a heartbeat and provide you the best of care. The trails at Stowe are great, especially the Expert terrain. But where Stowe really shines is the vast amount of off-piste skiing available. It is possible to ski from top to bottom without needing to ski a trail (except maybe to cross one) inbounds. Stowe has a boundary to boundary skiing policy, so as long as you enter and exit from open terrain, it's all fair game. If you venture out of bounds, there's about as much easily accessible acreage as there is inbounds. There are a number of factors that make the out of bounds terrain so good. First is that many of the original trails that were cut on Mansfield in the 30's actually didn't end up being incorporated into the modern-day resort. However, those trails still exist, and are skiable ... though for some of them, you'll end up in Underhill State Park, so you'd better have a ride home planned. There is one called "The Bruce" which ends near "The Matterhorn", about two miles down Mountain Road from the resort where you can grab the free shuttle back to the lifts. Heading into the off-piste areas to the North of the gondola provides a huge wooded playground that drops you into the Notch, and you can ski down the closed part of 108 and then it's a short walk back to the gondi. There is much of the out of bounds terrain that is "unofficially" maintained and thinned by the local ski bums during the off-season ... so lots of great secrets to discover. Finally, since being recently acquired by Vail Resorts, the ticket prices have been moderated some. If you walk up to the window, prepare to be gouged. However, if you buy your ticket online at least 48-hours in advance, you save a considerable sum. Also, Stowe is part of the "Epic Pass", so if you buy a season pass, you gain access to (as of this writing) Stowe, Okemo and Sunapee in the East, plus all of Vail's Western properties. An EpicPass can be had for under $1000 and provides unrestricted access to 65 resorts around the world.